The relationship a reader has with a publisher has far more impact on the effectiveness of online ads than the surrounding editorial content, which suggests concerns around brand safety may be misunderstood, according to a new study. The study – by Inskin Media, Research Now and Conquest Research – compared the conscious and subconscious reactions of 4,370 people, who were served ads on websites either with or without publisher branding. It revealed that ads on the publisher-branded sites increased consideration for the advertiser by 60% compared to the ads on the site without publisher branding. Furthermore, among readers with a close relationship to the publisher, consideration for the advertiser was 152% higher than among those who saw the ads on the site without publisher branding. 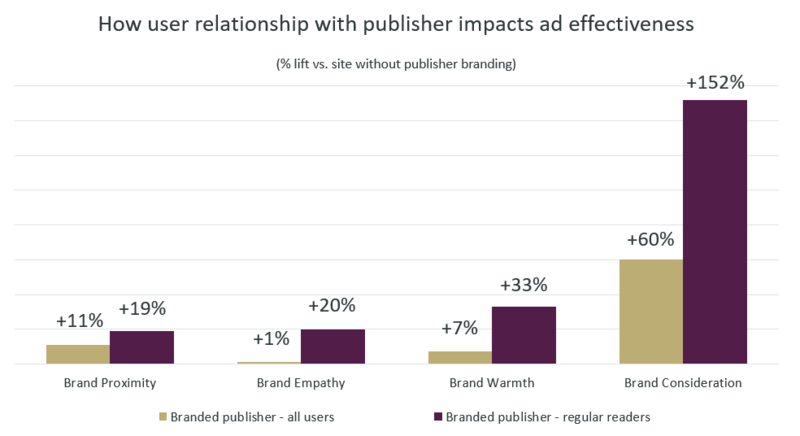 Alongside this, advertiser brand warmth was 33% higher, brand empathy 20% higher and brand proximity (how close people felt to the brand) 19% higher. In contrast, there was no systematic pattern to suggest that editorial content impacts the ad – be the article positive or negative or whether it had a similar theme to the ad. For example, a supermarket food advert next to an article about obesity did not overtly affect any brand metrics at all. Also, in isolated cases, a story that was both positive and had a similar theme to the ad could still elicit a negative brand association, suggesting individual parts of the article could have a disproportionate effect.